Recipes from “Panini, the simple tastes of Italian style bread” (New Holland Publishers, 2015) by Veronica Lavenia. Her next book “The Rustic Italian Bakery” (New Holland Publishers, 2015) will be released November 2, 2015. A source of inspiration for many recipes – both sweet and savory – carrots are one of the most versatile and tasty vegetables. This sauce is a fresh and light idea to use carrots in a different way. Sicilian capers give a truly unique flavor to a very tempting sauce. Great for stuffing toast and classic panini, or over a slice of hot bruschetta, this sauce is a delight to try. Peel and dice carrots. Blend them with the lemon juice and salt. Add the olive oil, diluting, if necessary, with half a glass of water. 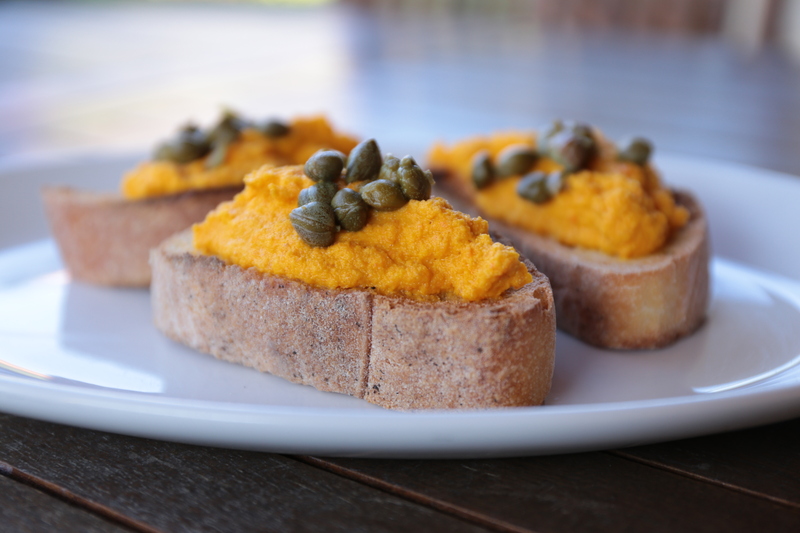 Spread over the slices of toasted rustic bread, add capers and serve immediately to prevent oxidation. Originally from Naples, yet a dish that quickly spread throughout the south of Italy, ‘Eggs in purgatory’ takes its name from the cult of the souls in purgatory, strongly felt in Naples. In the narrow streets of the historic center of the city there are many shrines (small chapels) dedicated to saints, with a corner reserved for the souls in purgatory, depicted by white figures surrounded by flames. Metaphorically, the white of the egg, in the middle of the red tomato, recalls the memory of the souls (white) into the fire (red) of purgatory, just as it is depicted in those small chapels. A recipe of the folk tradition, the ‘Eggs in purgatory’, like Pappa al pomodoro and bruschetta, stood among the most iconic dishes of Italian cuisine. Cut the onion, basil leaves and carrot (the latter into thin slices). Add the vegetables to the tomato sauce and cook to reduce the sauce. Add two tbsp of olive oil, add the eggs and let them cook for three minutes into the tomato sauce. Season with salt and pepper. 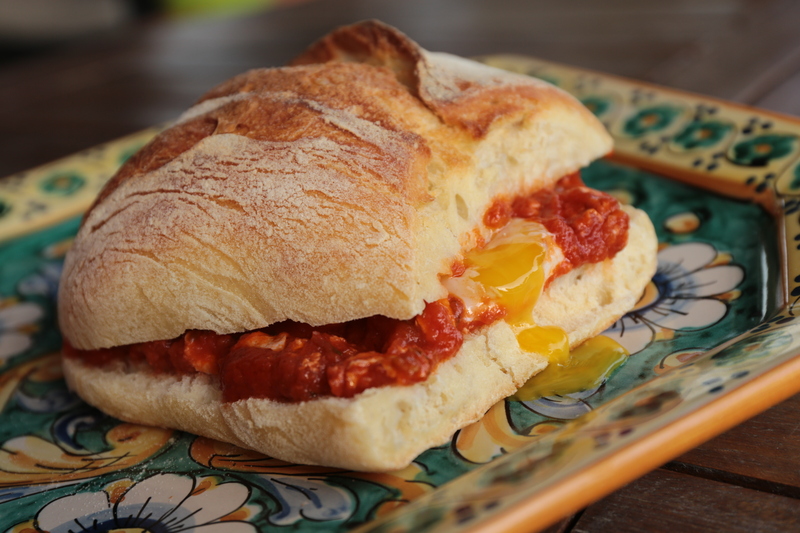 Stuff the bread with eggs in purgatory and serve immediately. Italian author Veronica Lavenia is an international food writer and columnist. In PANINI, Veronica has included traditional family recipes that have been used for many generations, together with recipes born out of a personal experience that helped her to discover how useful it is to share tasty and healthy ideas. Veronica loves to cook what she grows in her family garden and explore new culinary possibilities and alternatives, together with ingredients that are affordable and easily available. To learn more go to www.veronicalavenia.com.